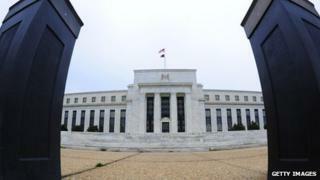 The US Federal Reserve intends to continue reducing economic stimulus measures, minutes of the central bank's January meeting have confirmed. The Fed's policy makers said they expected to cut monthly bond-buying in predictable $10bn steps. The Fed cut its bond-buying programme to $65bn a month at the end of its most recent meeting in January. That came despite a string of disappointing US economic data, including weak jobs figures. The bond purchasing programme is intended to keep interest rates low and stimulate growth. According to the minutes of the January meeting: "Several participants argued that, in the absence of an appreciable change in the economic outlook, there should be a clear presumption in favour of continuing to reduce the pace of purchases by a total of $10bn at each [policy] meeting." Some members raised the possibility that the short-term interest rate, also known as the federal funds rate, could be increased sooner than expected, as the unemployment rate is expected to fall below 6.5%. The federal funds rate has been at 0% since 2008. However, most members remained committed to keeping rates low for the foreseeable future. Overall, members of the Federal Open Market Committee (FOMC) saw an increasingly rosy economic picture through the rest of 2014. "The committee expected that, with appropriate policy accommodation, the economy would expand at a moderate pace and the unemployment rate would gradually decline toward levels consistent with the dual mandate," the minutes said. This was the last meeting helmed by outgoing chairman Ben Bernanke. Current Federal Reserve chair Janet Yellen is set to lead her first meeting when the FOMC next meets in March.